Interior design trends come and go and it’s not easy to ensure a home remains fresh instead of dated. Soft furnishings can only go so far in adding those ‘pops’ of colour so favoured by interior decorators. A splash of paint here and there can help spice up a room’s look, but it’s the layout of the room as well as the larger pieces of furniture that need to be addressed when it comes to keeping up-to-date. One of the biggest problems in the past has been the ubiquitous television set. If it is wall mounted, then there are cables to contend with. If it sits on a shelf, table or TV unit so the cabling can be discreetly installed out of view, then that becomes yet another piece of furniture to UltraViolet and place. With cables out of the way, the next challenge comes up when the TV isn’t in use. Usually, when the TV is off, the black square simply doesn’t fit into the décor, unless of course it’s a black and white minimalist theme and even that’s debatable. Samsung’s Ambient Mode solves that as well – it elevates your television room or living space with decorative content, useful information, your own photographs or even by mimicking the texture of the wall behind it. 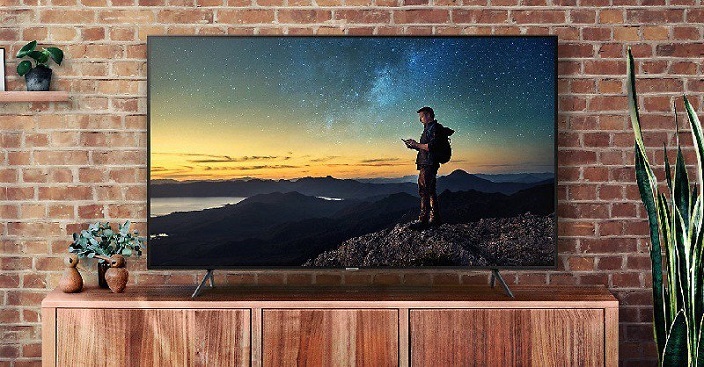 “Only Samsung removes the black screen, allowing your TV to seamlessly blend into the room and enabling you to completely personalize your space,” concludes van Nxumalo. Solving the issue of a blank screen dominating whichever room it’s in makes an immense difference to the way interior designers will view the television. In the past, it’s been about hiding the screen, but now it’s about how best to display it, integrating the TV into the décor theme and style. Additionally, connecting the television to a smartphone means a room’s ambience can be seamlessly changed to address moods and activities – from a serene image with soft background music to an invigorating scene with upbeat music to match; making the television an interior décor game-changer. Contact me at thelifesway@gmail.com to collaborate on your campaigns. #TheLifesWay #PhotoYatra!